Script Tees are really rather lovely, are they not? I have really wanted one. Unfortunately I just couldn't find one I really liked within my price budget. I also made the mistake of imagining exactly what I wanted it to say. So then of course I couldn't settle until I had one that said just what I wanted. You know what this means, right? Yup, it means I had to make one. 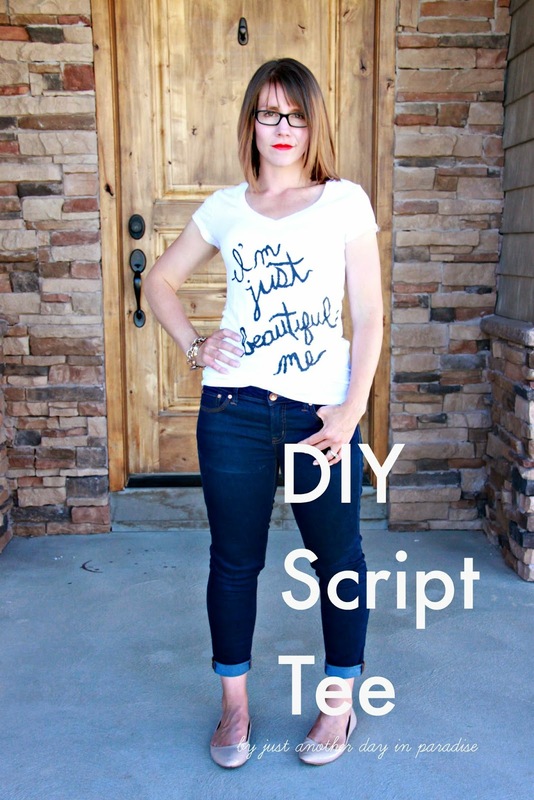 So make a DIY Script Tee I did. With the lyrics of one of my favorite songs too. 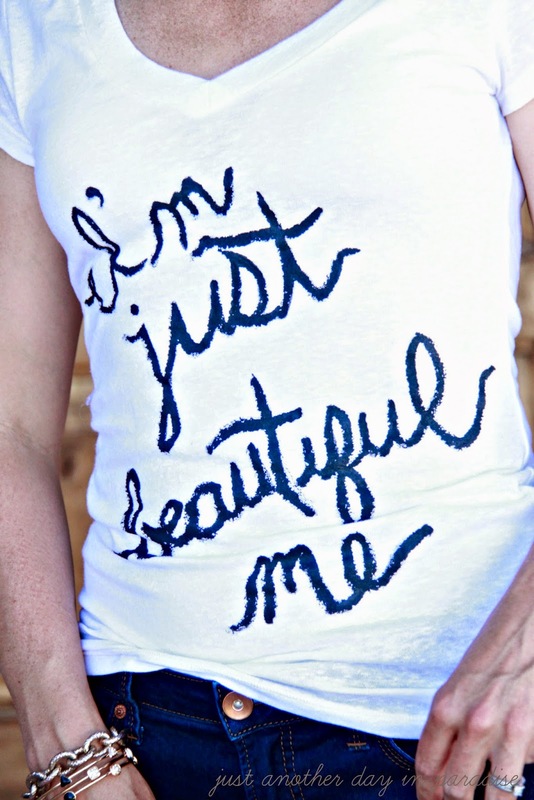 I'm no beauty queen, I'm just beautiful me...from Selena Gomez's Who Says. I have a soft spot in my heart for this song. Prepare yourselves for the sweetest story to follow. I actually had not heard this song when it first came out. Ask anyone who know me well, I tend not to be up to date on the current songs. So when Hubby came in and said he wanted me to listen to a new song I said, "Okay". He prefaced my listening to this song by telling me he wanted me to really listen to the words. He also said that the song reminded him of me and he wanted me to feel that way about myself. Then I listened to the song. Then I shed some tears. Then I kissed his handsome face. Then I listened to it again. I can't listen to that song without thinking about him and how beautiful he makes me feel. 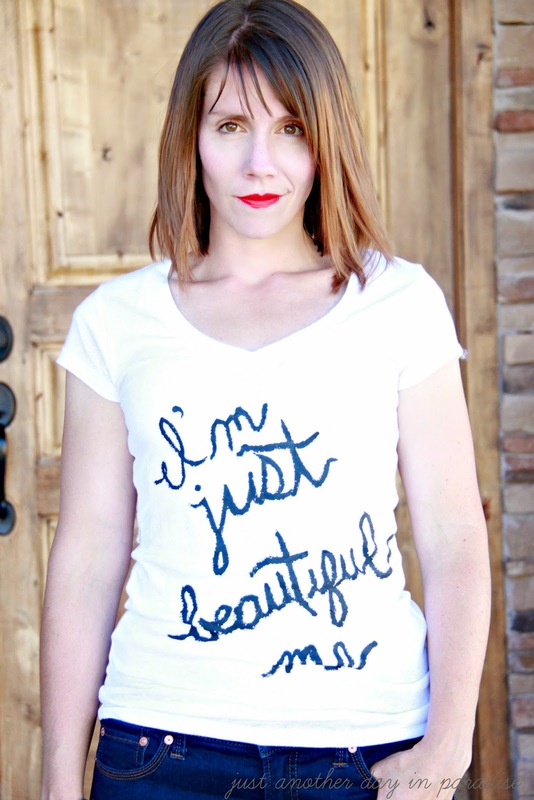 Now you can understand why I wanted a scrip tee with the phrase I'm Just Beautiful Me. Slip a piece of cardboard in the t-shirt. Write the phrase you want lightly with the fabric marker. 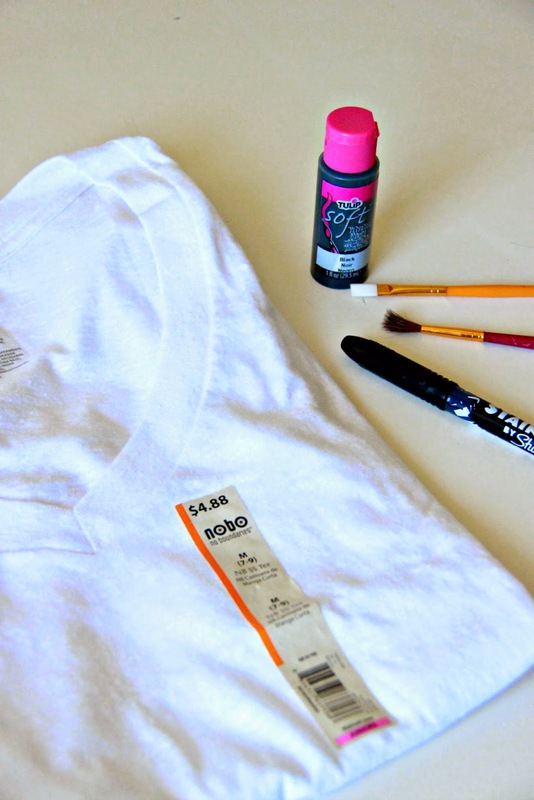 Then trace over your handwriting SLOWLY with a paint brush and fabric paint. Allow to dry. I speed up the process by using a hair dryer. 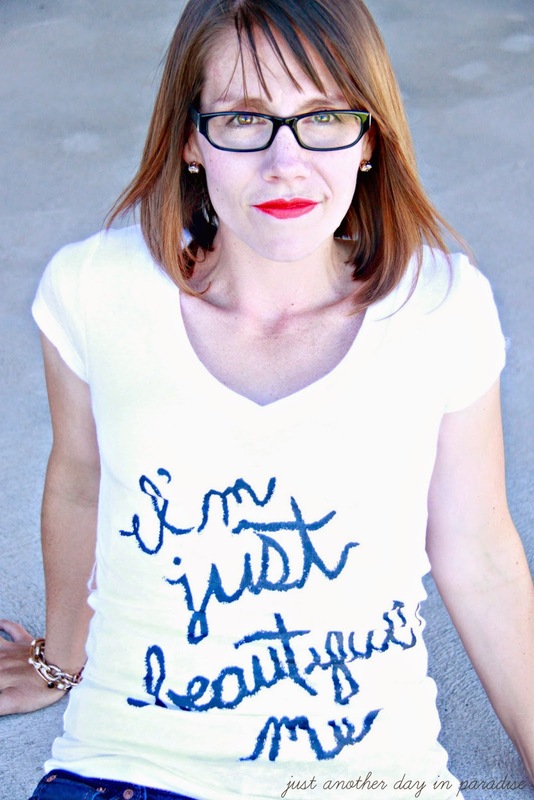 Then slap on some red lipstick and wear your new script tee proudly. 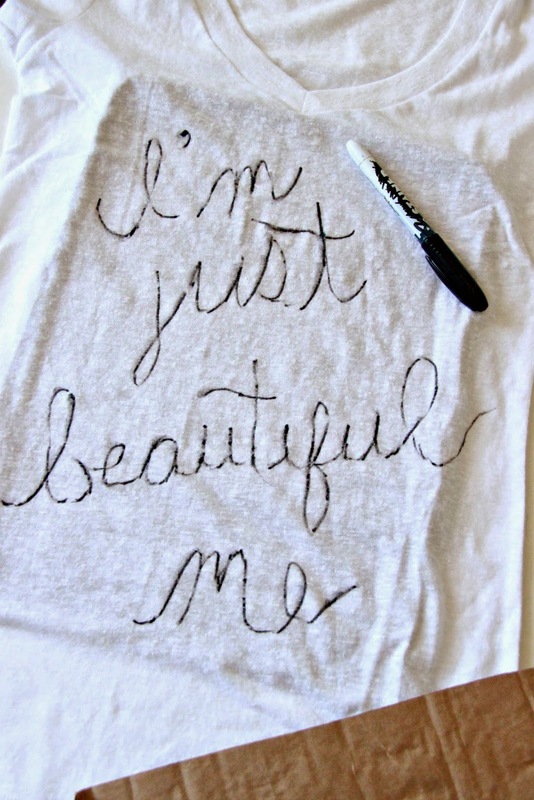 And believe you are beautiful. Where to start, you look gorgeous! I love your hair and that lipstick. I thought I was looking at your sister for a minute, and by sister I mean both of them! I heart you so much! I have always loved Spencer tons AND when people ask me how it is possible for me to really love all my in-law kids as much as I say I do, I simply tell them, I prayed so hard for the perfect ones for each of my kids. Everyone of them has found the right one, I pray all the time that your sisters find their "Spencer". What a sweet hubby! Now I'm gonna listen to that song. I'm soooo not up on the current music.....haha! I've been wanting to make one of these forever so now I just need to do it! You make it look so easy. ;). 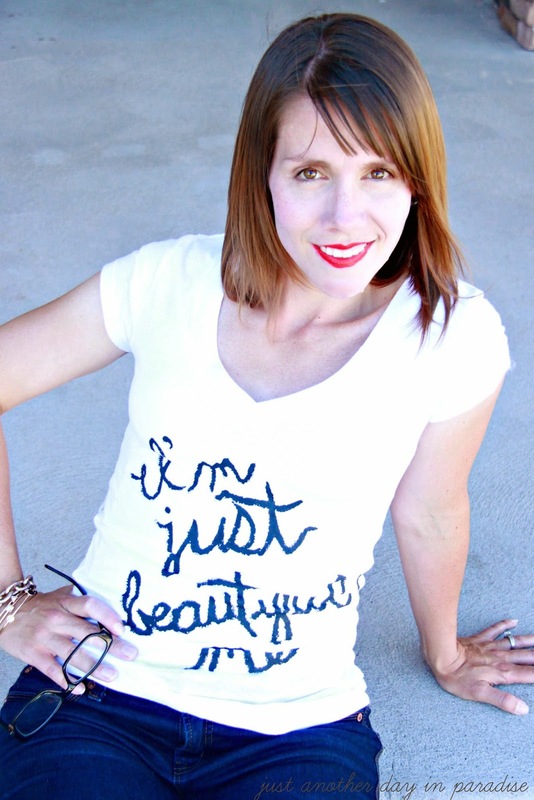 You look so gorgeous in these pics! 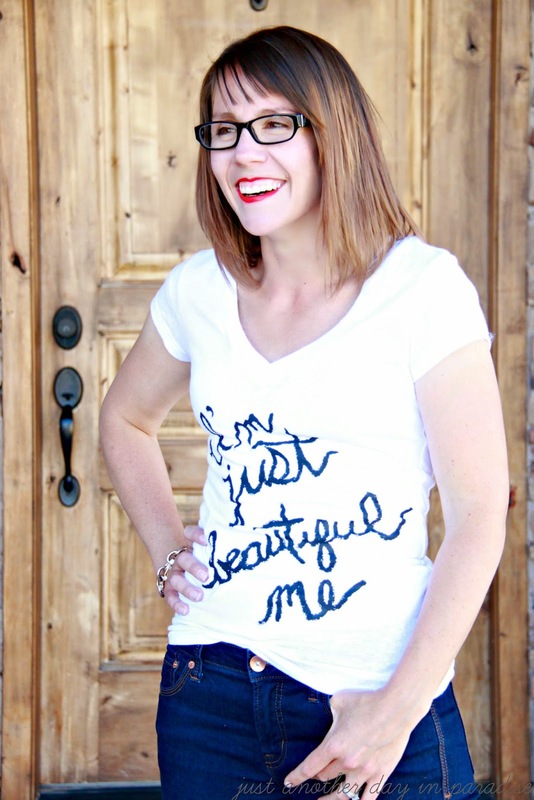 Way to rock the red lip!